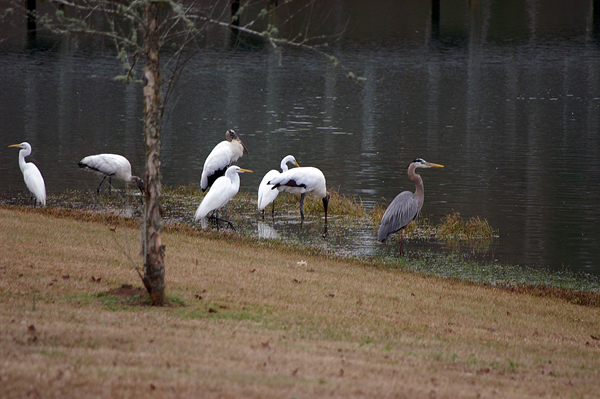 A severe winter storm drove the herons, wood storks and egrets into the Florida panhandle. They are hanging out together waiting for better weather. It is uncommon to see the wood storks rubbing wings with the herons and egrets, since the herons and egrets are sight hunters and the storks hunt by feel. This entry was posted on Thursday, March 29th, 2012 at 12:02 pm. It is filed under Architecture / Interior, Environment, Nature, New Images and tagged with Ardea herodias, bird, black, egret, elegant, great blue heron, grey, predator, slim, white, wood stork, yellow. You can follow any responses to this entry through the RSS 2.0 feed.